A healthy, natural alternative to energy bars was found by an American-Indian company: the Tanka Bar, made with bison meat and cranberries. The company, based on the Pine Ridge Indian Reservation, came up with the Tanka Bar as a modern-day spinoff of a traditional food of the Lakota tribe called "wasna" that sustained Great Plains Indians during long trips centuries ago. 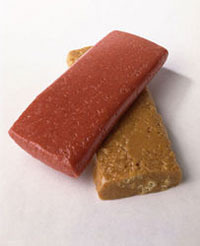 The Tanka Bar is produced and marketed by Native American Natural Foods. After two years of development, the bars go on sale Friday online at www.tankabar.com and will eventually be sold at some stores. One of the company's owners, Karlene Hunter, said native people were healthy before they started eating food with which they were unaccustomed. That has led to epidemic rates of diabetes and other health-related problems, she said. "We're getting back to a healthy lifestyle and a healthy diet," Hunter said of the new venture. "The buffalo supported everything to us - meat, utensils, clothing. It's coming full circle." Bison meat is high in protein and low in cholesterol. The cranberries add antioxidants and a sweet, natural flavor, said Mark Tilsen, the company's other primary owner. The bars look like jerky but have a lot more water in them than the dried meat, he said. "It will be the first protein bar on the market with meat in it and the first dried meat product that has fruit in it," Tilsen said. "We feel like we're creating a new category in the (energy bar) market." Children on the Pine Ridge Reservation who helped test the various recipes dubbed the Tanka Bar "buffalo candy," Tilsen said. The 70-calorie buffalo snacks are much healthier than cheap snacks loaded with processed ingredients, said Dr. Kevin Weiland, an internal medicine physician from Rapid City who wrote a book called "The Dakota Diet" about the health benefits of eating grass-fed buffalo and other such food from the plains. Weiland was part of an upcoming television documentary filmed earlier this year featuring Beau LeBeau, a Lakota man who lost more than 60 pounds (27 kilograms) in 100 days, lowered his cholesterol and reduced the fat in his liver simply by eating bison and other natural foods. "He basically is a diet-controlled diabetic by what he's eating," Weiland said. One of the people who helped with development of the Tanka Bar, buffalo expert Duane Lammers of Hermosa, said more Americans are discovering the benefits of eating bison, though the market is minuscule compared with beef.